Ah, the wrap dress. It’s hard to remember a time when the iconic piece didn’t take up an important place in our wardrobes. Of course, Diane von Furstenberg can stake her claim to it; it was she who made it the height of sophistication back in the ’70s. However, its recent resurgence can be attributed to the likes of Reformation, Ganni and Réalisation. Clearly a host of contemporary brands have cemented the wrap dress as a modern staple, but the big question is how to wear it. When the piece first went boom, it was introduced as a throw-on style that required almost no styling. Which is still true, but we’ve started to notice people reconfiguring them into countless other outfits as well. The elegant wrap dress is easy to wear and looks flattering on absolutely everyone, making it one of the most inclusive buys out there. And though we’re transitioning into autumn, your faithful garment doesn’t have to be pushed to the back of the closet till spring. Whatever the season, you can style them in so many ways; all you need is a bit of 2018 know-how. Which is where we come in. We’ve tracked down some wrap-dress inspiration from fashion’s coolest corners. Scroll down to unlock exactly how to wear yours; then shop the vital pieces to re-create these great looks. 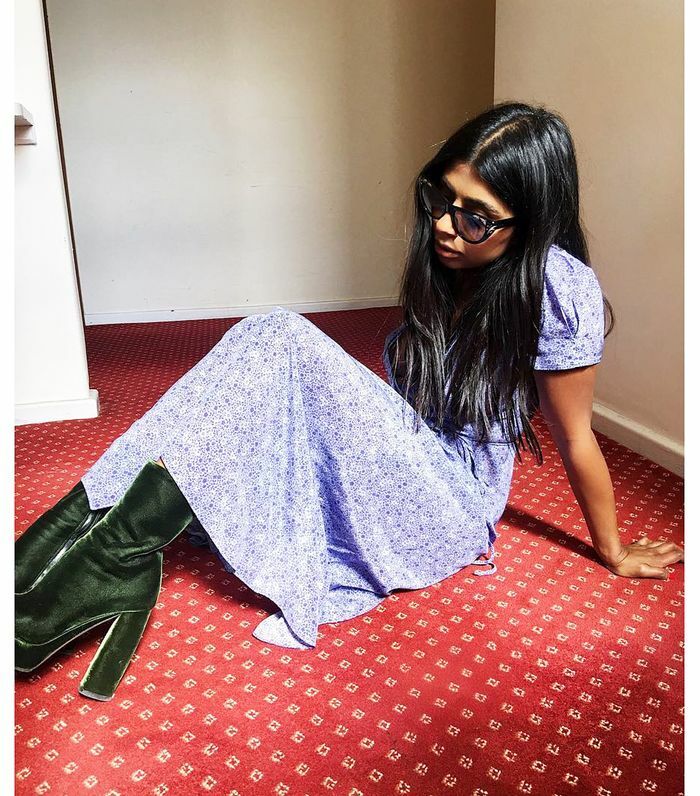 You needn’t stop wearing lightweight dresses just because it’s autumn. Instead, try pairing them with heavy-duty textures like velvet or leather to give them a new-season spin. This cult-status dress also comes in a cute cherry print. These boots are just like Monikh Dale’s Miu Miu pair. No one will believe these cat eyes aren’t designer. 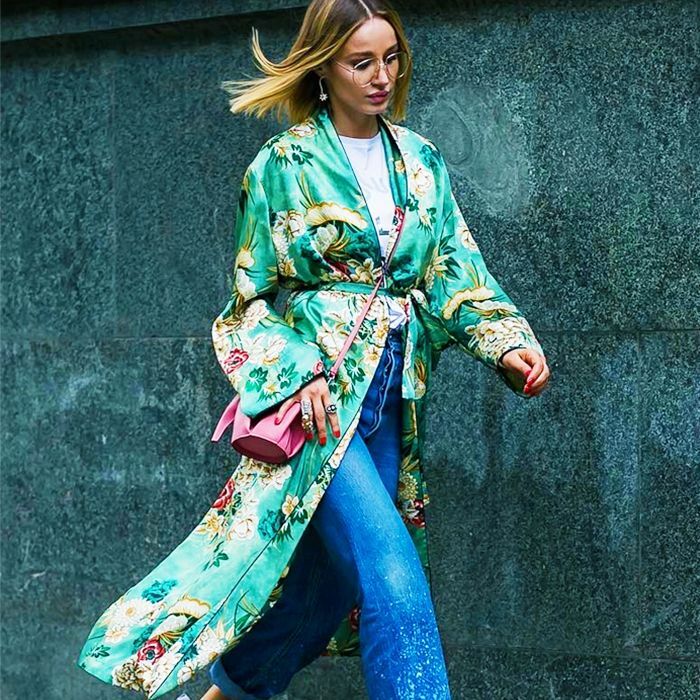 If you haven’t already succumbed to the dress-over-jeans look, it’s time you gave it a go. Pop on your favourite skinny or straight-leg jeans; then tie your wrap dress tightly around your waist. Pull the underside as far over as you can to create a wider split. The mustard hue on this gorgeous dress will look beautiful on all skin tones. Call off the search—we’ve just found the perfect pair of straight-leg jeans. Invest in these now and you’ll wear (and love) them for years to come. Give even the most glamorous dresses a downtime spin by wearing them with trainers. Kudos to Pernille Teisbaek for sticking to the same colour palette; it makes her outfit look seamless. Just add your trusty leather biker jacket. This push-lock bag is as chic as they come. The trainers those in the know are wearing on repeat. We all know that leopard print is big news for autumn, but Giovanna Battaglia Engelbert has taken the trend to the next level with her head-to-toe styling. Follow her lead by wearing pieces in the same print. Just make sure the prints vary in size or colour to keep it from becoming too matchy-matchy. This is probably the best leopard print we’ve seen. Forgo the crossbody strap and use the top handle for a glossy approach. These best-selling shoes have been reissued more times than we can count. Dress down a slinky style by layering one over a plain tee. Not only will you get more wear out of your wrap dress, but it’ll also keep you toasty. Win-win, if you ask us. Oh, and we love the addition of Western boots—very A/W 18. For nights out, weddings and more. You’ll find tons of excuses to wear this beautiful dress. A fitted white tee is a must-have in any wardrobe. Like we said, Western boots are all the rage this season, so invest in some ASAP. Yes, it’s official—the best autumn dress outfits involve a chic wrap style.